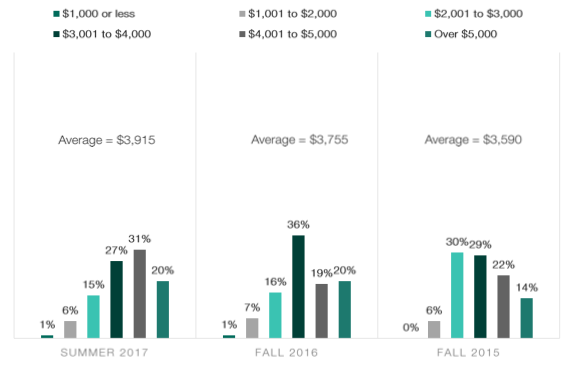 For nearly ten years, the Incentive Research Foundation (IRF) has tracked the vitality and variability in the incentive, rewards, and recognition market. The annual capstone is the IRF Outlook Study, which provides a detailed look at important industry metrics. 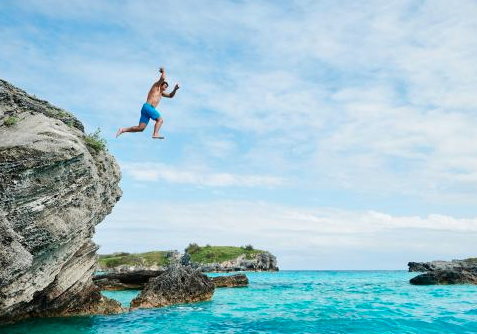 Executed in August 2017, 229 industry representatives, including suppliers, corporate end users, and incentive house representatives, gave their feedback on the outlook for incentive travel and reward programs in 2018. To assist with reporting the state of the industry, the IRF launched the Net Optimism Score in 2017. 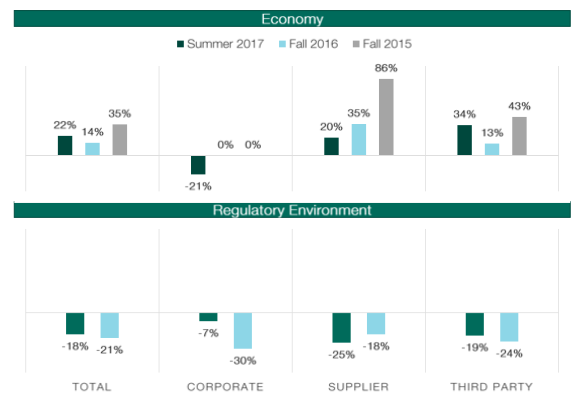 Now in its second year, this simplified metric tracks the economic outlook for the incentives industry. Similar to the well-known Net Promoter Score, the Net Optimism Score is the percentage of respondents providing a positive rating to an industry question, adjusted by subtracting the percent giving a negative rating. 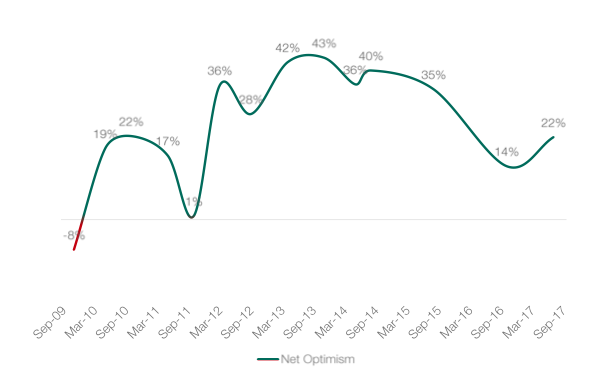 A higher Net Optimism Score indicates greater optimism in the industry. 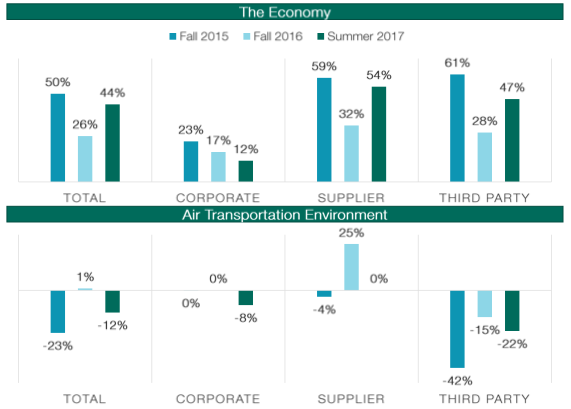 The incentive travel industry’s Net Optimism Score for the economy is up from 26% in the fall of 2016 to 44% in the summer of 2017. While net optimism has remained positive for incentive houses and third parties over that last three years, it has steadily declined for corporate program owners. 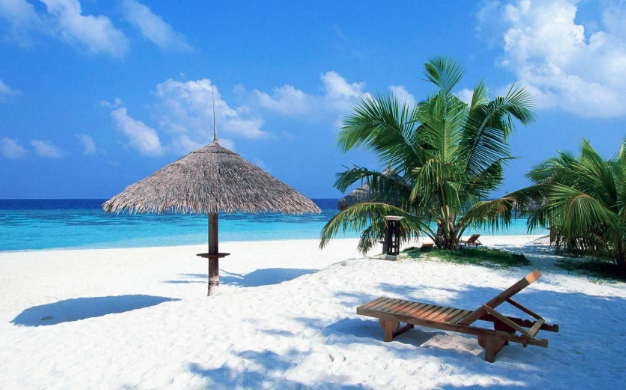 Incentive travel budgets are up again to an average per-person spend of $3,915, an increase of 4% year over year. However, 60% of respondents said costs are rising faster than budgets. The largest number of net increases reported by respondents of incentive travel were as follows: inclusion of wellness/well-being components (38%), all-inclusive pricing options (35%), budget for F&B (25%), and budget for rooms (25%). The top five destinations for respondents were the continental United States, Hawaii, the Caribbean, Mexico, and Europe. 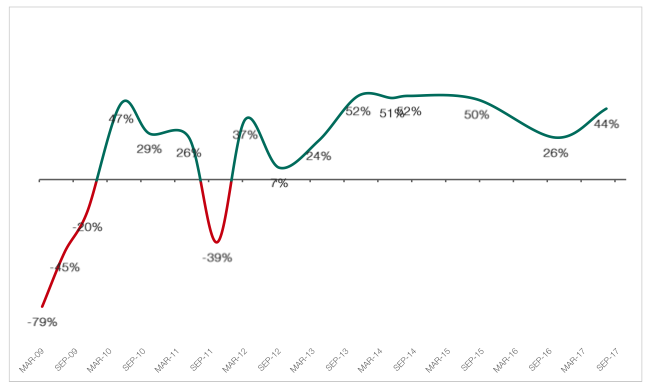 The merchandise/gift card program industry’s Net Optimism Score was up as well—to 22%. 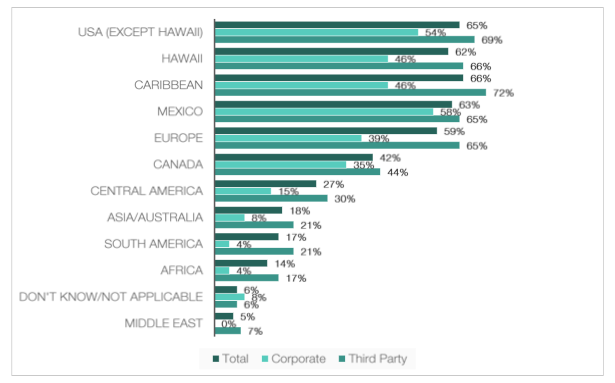 As with incentive travel however, third party stakeholders and incentive have been more positive, though. Corporate end users have been more pessimistic with a net positivity decline from 0% in 2016 to -21% in 2017. 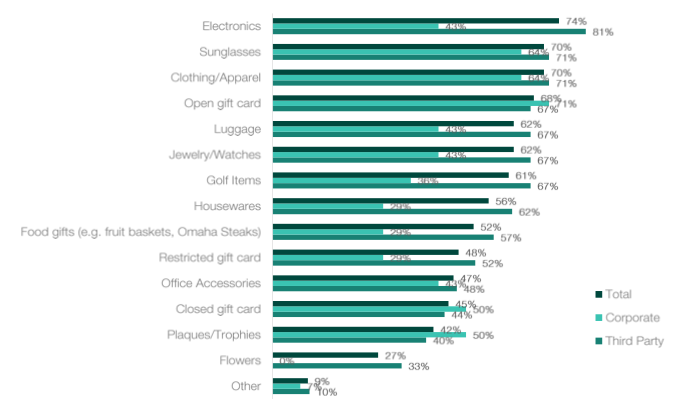 Incentive house/agency respondents chose electronics, sunglasses, clothing/apparel, open gift cards, and luggage most often for their programs. 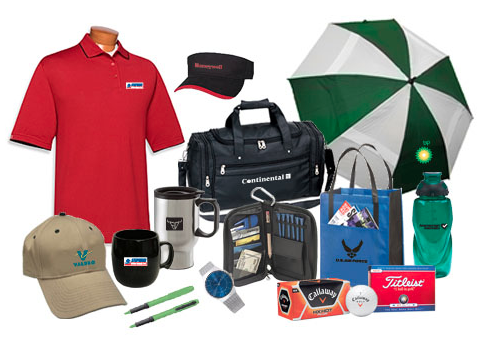 Open gift cards, clothing, sunglasses, closed gift cards, and plaques were the most frequently selected items by corporate end users. 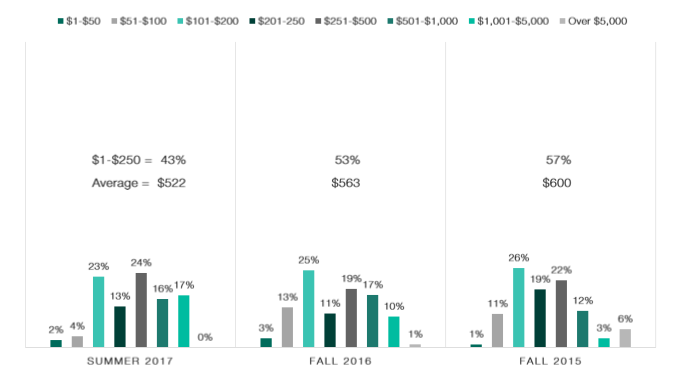 For gift card and merchandise programs, the percentage of respondents reporting an average per-person spend budget between $1 and $250 has declined to 43%. Those with budgets from $251 to $5,000 per person have risen to 57%. Almost a third of respondents said the number of participants earning a reward would be increasing. 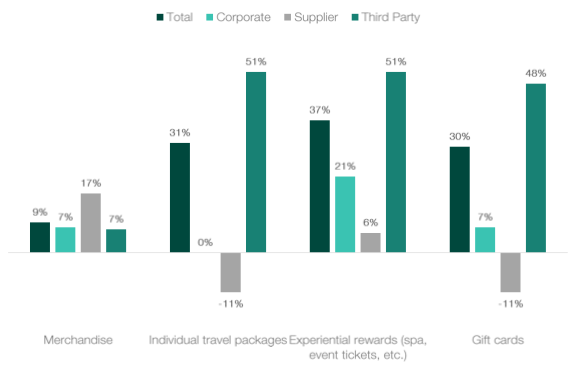 Almost a third of respondents indicated an increase in individual travel packages (31%) and experiential rewards (37%). 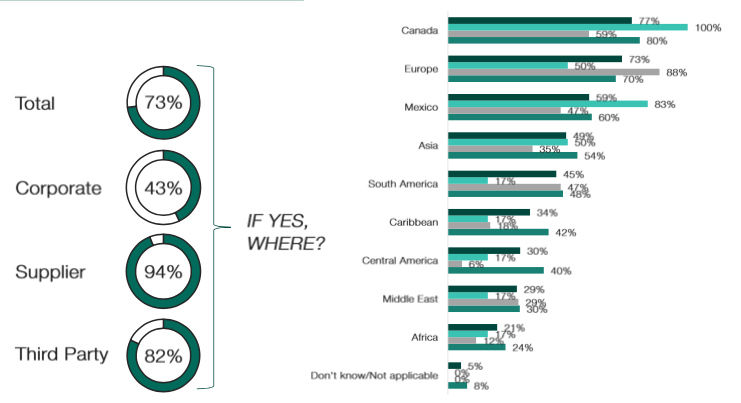 Almost three-quarters of respondents said they have participants outside of the United States in their non-cash reward programs. Industry stakeholders expect the financial performance of their own firms to be strong in the coming year, despite a somewhat less optimistic outlook for the economy. Regulations continue to be difficult to navigate with almost two-thirds of respondents saying it is difficult to stay informed about the federal, state, and local regulations impacting programs.